It isn't very often that you make a purchase and say "Wow, that was one of the best purchases I've made in a LONG time", but that is exactly what I've said multiple times since purchasing the Archer C9 WiFi router from Amazon. The main reason I say that is because all other things being equal, I doubled my WiFi connection speed and fixed a long standing problem where I could not reliably stream anything, by doing nothing other than replacing my previous router with the Archer C9. It has made a huge difference for me. The main reason I decided to upgrade to the Archer C9 was because I was having to reboot my previous router regularly, several times a week, just to be able to use the internet at all. Forget about streaming anything. Even though my Comcast connection is a fast 75Mbps download speed, I could never stream anything even being only 10 feet from my old router. For comparison, my old router was the high powered Buffalo WZR-HP-G300NH. With the new router, I installed and configured it in less than 5 minutes and when testing my connection speed over WiFi on my laptop, iPhone 6 Plus devices and on the iPad, the speed went from 43Mbps to 90Mbps instantly. That speed was more than double and quite a bit higher than the promised 75Mbps speed that Comcast advertises, impressive to say the least. I was also immediately able to stream movies and video from my phone or laptop to my ChromeCast player flawlessly. And on the plus side, I've owned the router for 3 months now and have only rebooted it twice and I don't even think that was necessary. I was having problems playing online games with Xbox Live and in both cases, it was actually a problem on their side. 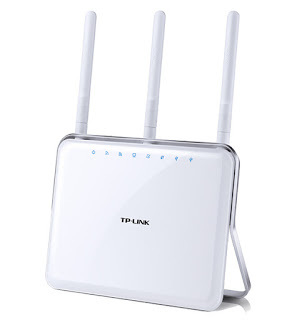 As far as the technical details go, the Archer C9 is made by TPLink and it is a 802.11AC Dual Band WiFi high powered router, that supports the latest in WiFi technology and provides both 2.4GHz (600Mbps) and 5GHz (1300Mbps) bands simultaneously. 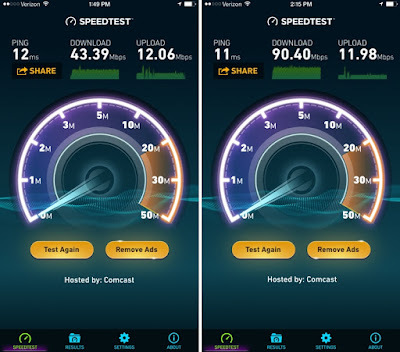 That means that your newer devices like the iPhone 6+ and newer iPads can take full advantage of the increased speed and bandwidth that a 5GHz AC connection provides, while still fully supporting your older devices as well. That also means that you'll be able to stream the highest quality HD video without any lag. Additionally, the router comes with USB 2.0/USB 3.0 ports and 4 - 1GB network ports, so that you can easily share a printer locally and files & media with networked devices. It also looks really cool too! These days we just expect WiFi to be available and to work as it should and the Archer C9 does that right out of the box, without any tweaking. I heard about the Archer C9 from several folks I work with, 3 of them had recently purchased the router themselves and they all have had good experiences with the new device. There are currently 2,800+ reviews on Amazon with an average rating of 4.5+ stars. My review would definitely be 5 stars. It is one of those purchases that exceeded my expectations greatly and that I wish I had made much sooner. Given how well this one just works, I can't believe that I dealt with the connection issues, constant reboots and just overall poor connection issues for so long with the old router. 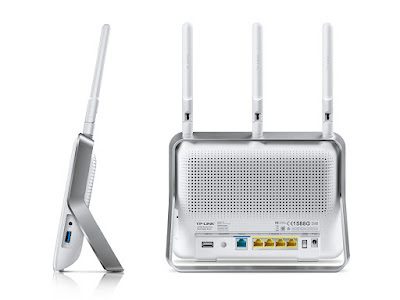 If you are experiencing any issues with your existing WiFi router, or just looking to upgrade and take advantage of the latest technology, I can wholeheartedly endorse the Archer C9. I haven't experienced a single problem with the device in the 3 months I've had it and I couldn't be happier with the results. I'm no stranger to back pain. I've suffered from lower back pain in different forms, for most of my adult life. However, I recently experienced something new to me, which was intense sciatica or sciatic nerve pain in the back of my leg, caused by a bulging disc in my lower lumbar region. The disc between my L5 and S1 vertebrae is bulging to the left. The strange thing is that I didn't do anything in particular to cause the pain. I was just going about my normal daily routine and when I got up from my chair at work, I noticed a bit of stiffness one day. By that evening, the pain was increasing gradually and that next morning it was unbearable. I've had dull, pulsing sciatic nerve pain down one of my legs in the past, but it was more an annoyance than anything else and it went away on it's own in a day or two. My recent pain was constant, intense and the worst pain I've ever experienced. In this post, I will detail what I went through and provide some details on what worked for me, that I hope can work for you as well. Of course, I am not a doctor and you should definitely consult a doctor to get a proper diagnosis and treatment regiment. I just wanted to provide some information from my experiences, that I hope can provide some relief for you as well. If you're in a hurry, you can scroll to the bottom to the conclusion section, to see the items that helped me the most so far. 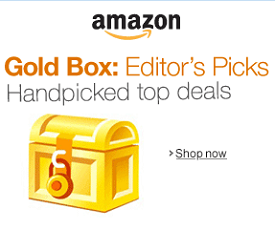 Some of the links below are affiliate links to Amazon. If you make a purchase, I would receive a small commission of approx 3-4%, at no additional cost to you. "The sciatic nerve is the largest single nerve in the human body; it runs from each side of the lower spine through deep in the buttock into the back of the thigh and all the way down to the foot. It serves a vital role in connecting the spinal cord with the leg and foot muscles. Sciatica pain symptoms commonly originate in your lower back area and then shoot down one, or sometimes both of your legs. That happens when the sciatic nerve gets activated, usually when irritated by a herniated or bulging disc. Herniated discs are different from bulging discs. Herniation is when the jelly-donut like filling in the center of a disc leaks out into the spinal cavity, due to a tear in the tough cartilage layer of the disc itself. A bulging disc occurs when the entire disc extends outside the space that it would normally occupy. Picture a hamburger patty protruding from one area of the bun. The symptoms of sciatica can vary, depending on the situation. In order to determine what is causing your pain, an Xray can help, but usually an MRI is needed in order to figure out exactly what is causing your pain and to determine a proper treatment plan. It was an MRI that determined that the disc between my L5 and S1 vertebrae was bulging to the left, which was pushing against the sciatic nerve on my left side, causing the constant, intense pain down my left leg. In my case, the pain originated in my buttocks on the left side and went down the back of my thigh, stopping close to my knee. The pain was constant and I could not do anything that would put pressure on that nerve. That meant I could not sit at all and standing was painful as well, since gravity causes pressure on the spine which causes the disc to bulge and it actives the sciatic nerve. During the first 5 days, the only thing I could do was lie down flat on the floor, for the most part. Most online advice for sciatic pain says to try and continue normal activity after a day or two of rest, but that just wasn't possible for me. Even lying flat on the floor was painful. I tried Ibuprofen, thinking that would help the swelling and inflammation, but it did not help much at all. Tylenol seemed to help a little, but only slightly. It only helped enough to catch a tiny bit of sleep, while it lasted. I tried taking 1/2 of a muscle relaxer, but it made me anxious and it did not help to take away the pain, so I didn't continue to take that. During that first 5 days, I slept at most 3 hours a night and it was in little 15-20 minute chunks. The lack of sleep made things even worse. I tried to do a few stretches that I found online, but at the time the pain was so intense I couldn't do much. I also didn't know the bulging disc was the cause of my pain at the time, so I didn't want to do stretches for the wrong underlying issue and cause more problems. After 5 days of suffering, with little to no relief, I posted about my pain on Facebook and received responses from a few friends and family with suggestions. The first one was to try apply a topical creme to the affected area where the nerve is inflamed. Much to my surprise, this was an absolute MIRACLE for me. We happened to have one of the suggested remedies at the house, Tiger Balm and within 20 minutes of applying the balm to my left buttocks and the entire back of my thigh from there to my knee, the pain began to subside for the first time that entire week. I couldn't believe something so simple, could have such a big positive effect so quickly. It was surprising, because in all my online research that week, I didn't see any mention of those types of products. The only downside of Tiger Balm, is that it has a menthol odor to it, similar to Vicks's Vaporub, but it subsides over time. The other suggestions worked just as well. They included Aspercreme with Lidocaine and Salonpas. One caution on Salonpas though, it contains an aspirin component that could result in an overdose, if you utilize the product more than the recommended dosage. For that reason, I decided to rotate between Tiger Balm and Aspercreme with Lidocaine only. As you would imagine, these are not a cure for sciatica or a bulging disc, but I credit them for being a true miracle because they were the only thing that helped me cut down the pain so that I could actually sleep, walk and sit, so that I could begin to work fixing the underlying problem. The exercises in this YouTube video are very helpful. The one that seems to help the most is standing straight and bending in the direction away from where your disc is bulging. In my case, since my disc is bulging out to my left side, standing straight and bending to my right is helping the most. I continue to do that several times a day. 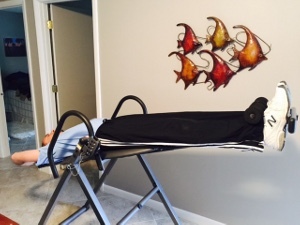 Another suggestion from a close friend was to try an inversion table. He has been using one himself for several years, to help alleviate similar pain. I did a lot of research on several of the more popular tables out there and went with the one shown here for several main reasons. Based on the extensive reviews, this one seemed to have more cushion and support, had a more solid overall feel, folds for easy storage and it can be used by yourself, without a spotter (although the manual recommends against that). It arrived in 2 days via Amazon Prime (free 30 day trial), took me about 90 minutes to assemble and I was inverting in no time. It lived up to all my expectations. Many of the other models have complaints about not having enough padding, especially around the ankles. That is not the case for this one. Everything feels very snug, solid and is very easy to operate. So far I've utilized the inversion table twice daily for 3-5 minutes each time, at a 20% inversion angle and it has helped greatly. You can work your way up from there to 40, 60 or 80%. I'm still not quite out of the woods yet, but I have returned to normal activities and just have to be careful to not overdo things at this point. I will be sure to report back with any new developments, but in the mean time, below is a summary of the items that helped me the most thus far. Keep in mind, these items helped me with sciatica pain caused by a bulging disc. If your situation is different, these same products and procedures may not be appropriate. As mentioned above, please be sure to consult a physician to get a proper diagnosis and treatment plan, for your specific situation. 7 Art Inspired Craft Cocktails For Your Next P’ART’Y! 1st Quarter 2016 Fun Happenings!